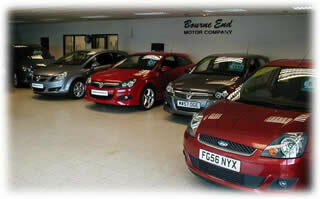 Bourne End Motor Company has been established in its prestige Showroom in Bourne End, Bucks since 1994. Just half an hour from Heathrow and located right between the M4 / M40 corridor, we are easily accessible. During that time Nick and Tim Pink and their staff have built a reputation for offering a personal and professional approach normally only found in the more prestigious franchised dealerships. For the past five years we have been recognised as one of the leading Vauxhall and Ford Specialists in the South East, specialising in cars of between six months and four years old. Many of these cars come direct from the manufacturer and in some cases have only covered delivery mileage. The savings can be quite considerable, ranging between £3,000 - £8,000 for a car that is only months old. As a Licensed Credit Broker, Bourne End Motor Company have credit lines with a number of finance companies, the primary ones being Northridge Finance and G.E. Money. They both offer different types of plans to suit the customer - straight Hire Purchase, Lease Purchase or Independence , which is their form of Personal Contract Purchase with options at the end. It is not just Vauxhall and Ford we source either. Over the years we have built up many contacts and can now achieve similar savings across many brands using our fleet discounts. We are linked to a computerised stock locator system linking us to over 300 dealers and allowing us to search over 8,000 available cars. All of our cars have a full service history and will normally have the balance of a three year Manufacturers Warranty. For those cars over 3 years old we offer a minimum of 6 months Parts & Labour Dealer Guarantee by Autotrust, a division of Car Care Plan which is owned by General Motors. In all cases part exchanges are welcome and we will also selectively purchase cars for cash. Please look at our testimonial page to read the comments from our many satisfied customer.